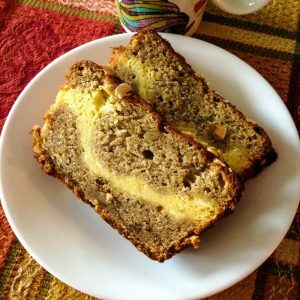 I am ashamed for taking such a long time to post this recipe on my blog. 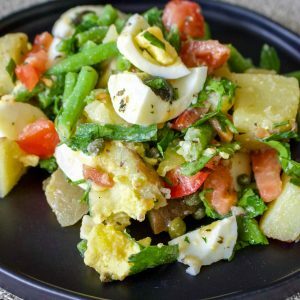 If I want to show you my traditions and heritage through food, this recipe is a must! As we are going through holidays and this recipe is the most traditional one for Christmas and New Year in Romania, I have to share it with you! 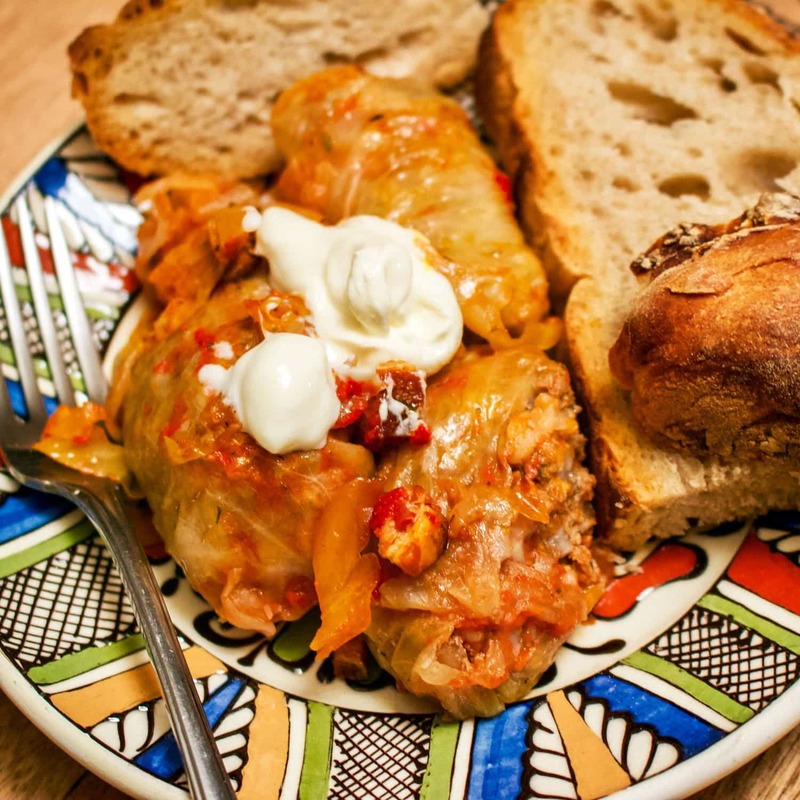 Many countries eat stuffed cabbage rolls, but I think it is more prominent in the Balkans and Eastern Europe. We make them with fresh cabbage in the summer or with pickled cabbage (sauerkraut) in the winter. 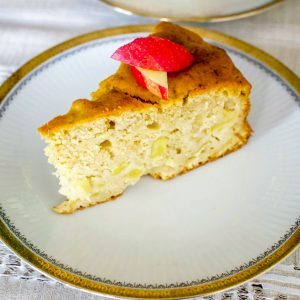 This recipe is an authentic traditional Romanian one and it is truly the way my grandma and my mom used to make it. There are different versions around Romania, due to the fact that each region of the country has a different cuisine or different influences. 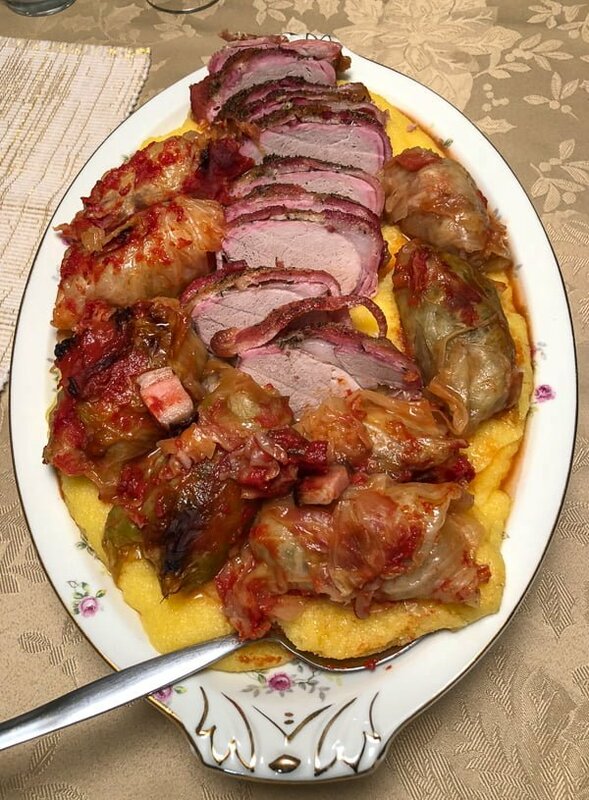 Romanians eat more pork than beef, and the traditional stuffed cabbage rolls are made with ground pork, especially in the winter and around Christmas time. However, you can also make them only with ground beef or a mixture of 50-50 pork and beef. My grandmother, for example, took pride on telling us how many cabbage rolls she made, and there were never less than a hundred! 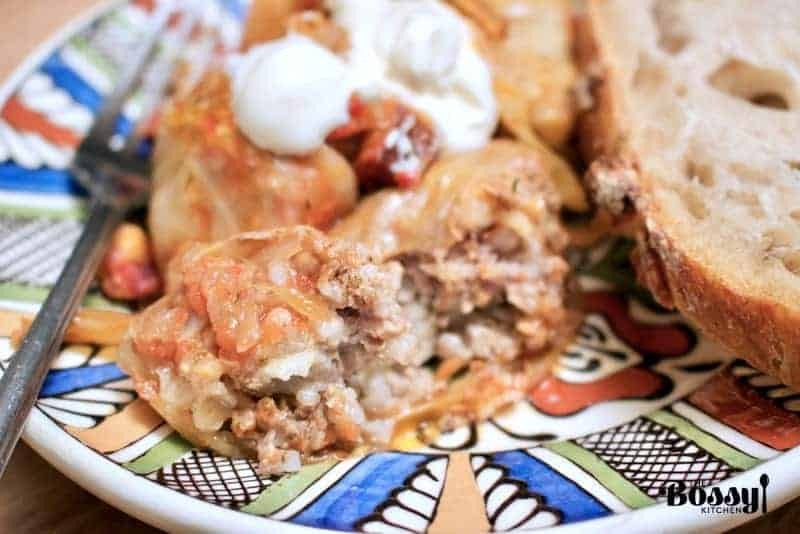 The Romanian stuffed cabbage rolls or “sarmale” are a must at any important event. 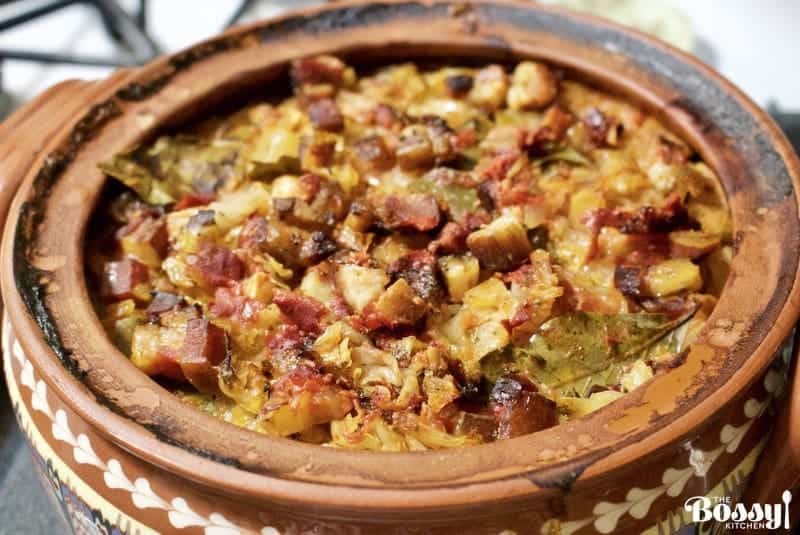 There is no Romanian Christmas without “Sarmale” and you will notice that any Romanian living abroad will tell you about them. 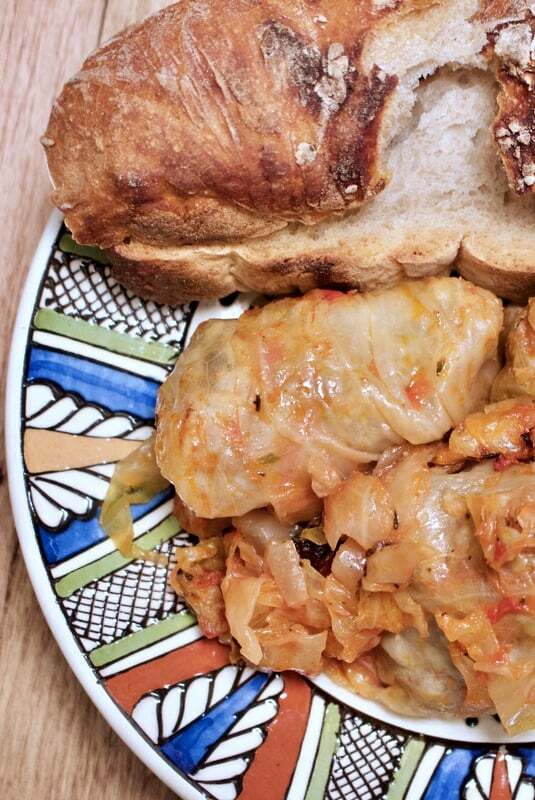 We tend to keep ourselves rooted in our own culture through food, so cabbage rolls are very important to us. We make them for weddings, funerals, and any other important occasions. We love them and we will make them for friends and family when we live abroad. It is our heritage and tradition and we are very proud of it! 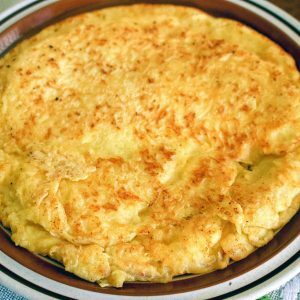 This recipe is made with cabbage that was preserved in salt and water, or sauerkraut. 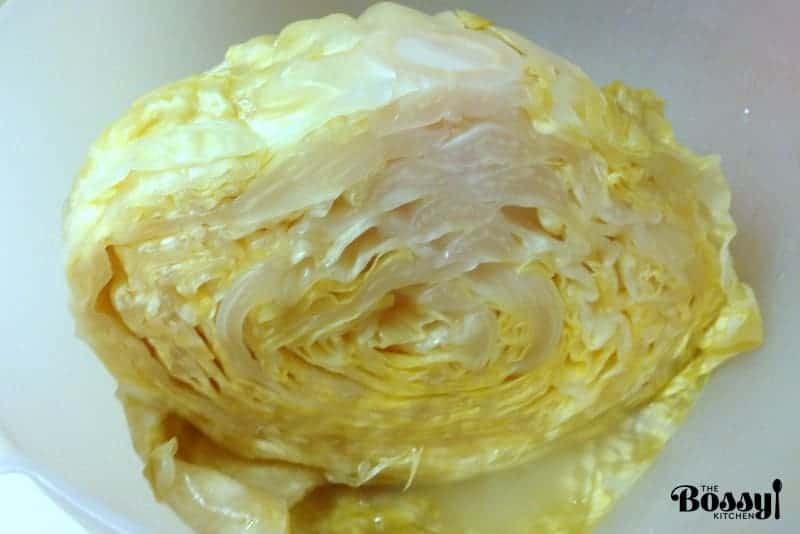 I grew up with preserved, pickled cabbage in winter. It was an important food item on the table together with other vegetables my parents canned in the summer. The food was scarce and if you did not can in the summer, you did not have anything to eat in the winter. 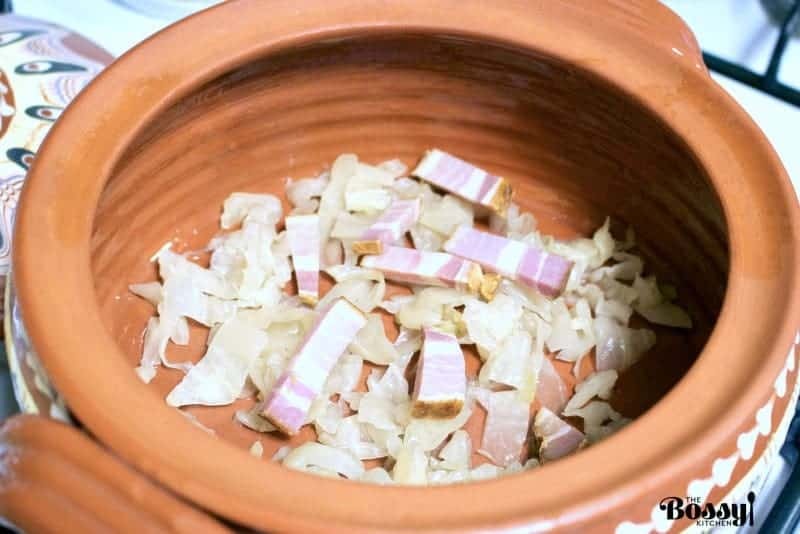 So, my parents used to buy around 50 kg(about 110 pounds) of cabbage in October and preserved it in a big barrel we kept on the balcony, in our little communist apartment in Bucharest, back in the 70-80’s. The cabbage was enough to feed all 4 of us during the cold months of winter. My mom made stuffed cabbage rolls, salads, soups and other things with it. It was the perfect food. or like this one here. Personally, I use what I can find around. I know that a lot of stores carry pickled whole cabbage, otherwise, ordering online is another option. These being said, let’s try to make the cabbage rolls. If you use the jars with cabbage leaves, then your work is easier, as the leaves are usually prepared for stuffing. If you buy a whole sauerkraut cabbage, then it takes few minutes to get it ready for the meat. Cut the cabbage in half and separate the leaves from the core. You will need to prepare the leaves before you do anything. This step makes the leaves more pliable. When you are done with this step, set them aside. Do not throw away the parts your removed from the leaves. 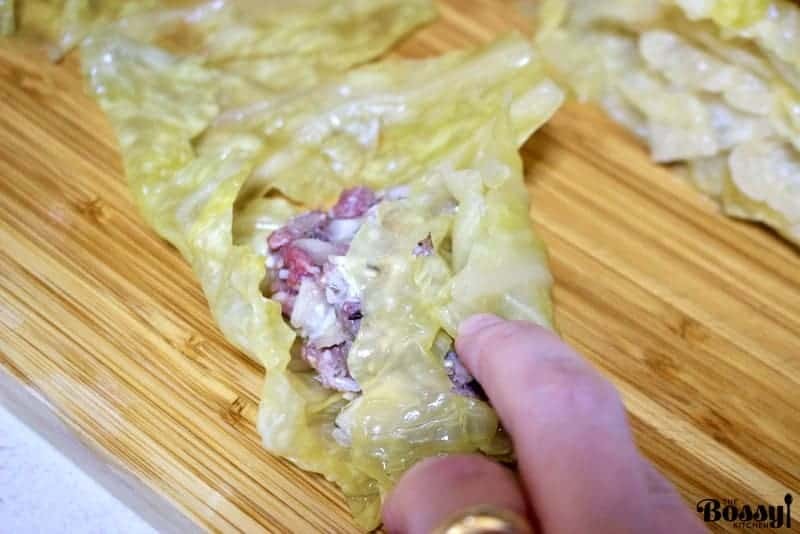 You can slice them thinly and add them in between the cabbage rolls. Also, you can use them on the bottom of the pot before you start adding the cabbage rolls. This way, the rolls will not stick to the pot. 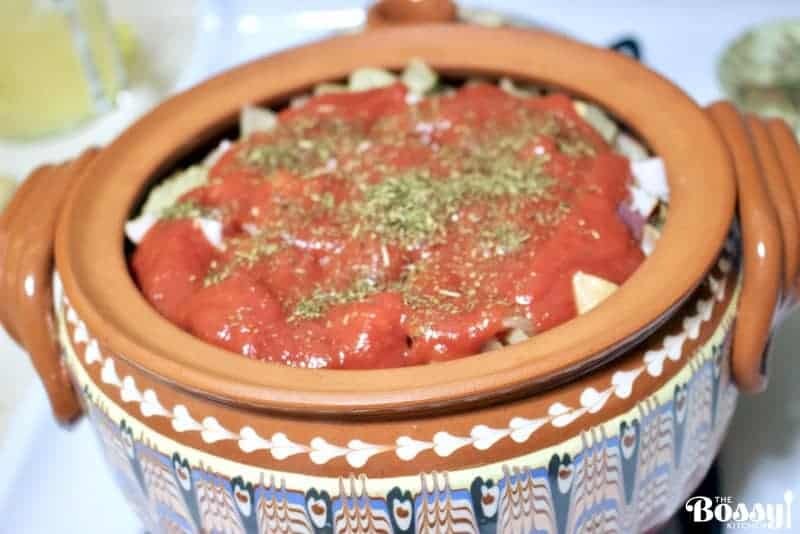 The Romanian cabbage rolls have a combination of meat, rice, onion and spices inside, so you will need rice, onion, pepper, thyme, marjoram, and some bay leaves. Mix everything together and make sure all the spices are incorporated properly. Set the bowl with the meat aside. People asked me if the rice is cooked before you add it to the meat. The answer is no, we add the rice to the mixture as it is. In the pot, when the cabbage rolls are cooking, the rice and the meat will cook together, so there is no need to cook the rice before. 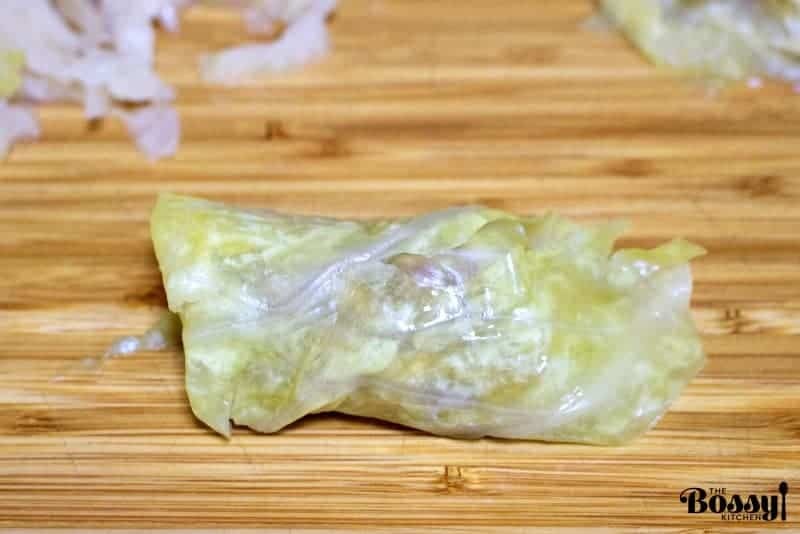 I personally like to see the rice inside the cabbage rolls, and if you cook the rice before, then you cook it again in the rolls, it will disintegrate. This my humble opinion that evidently can be debated, as everyone makes it differently. 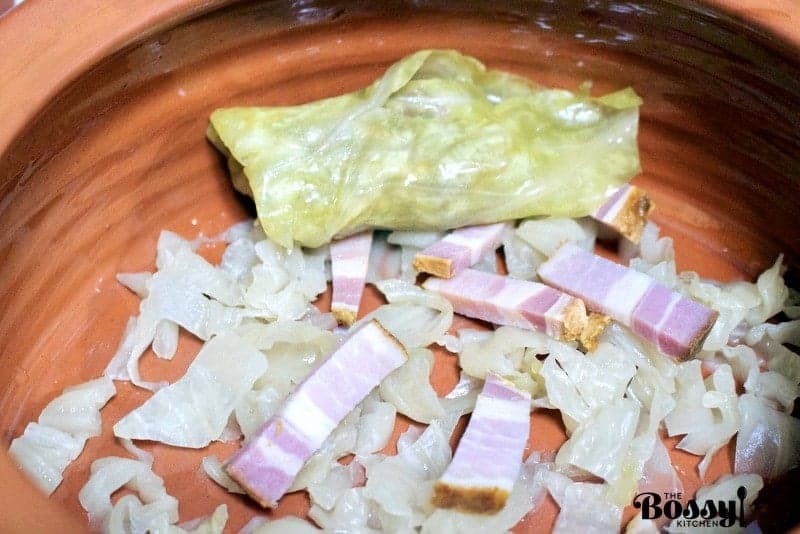 Lay a cabbage leaf on the table and put a small amount of the meat mixture on one side of the leaf. Wrap the meat inside the cabbage leaf. 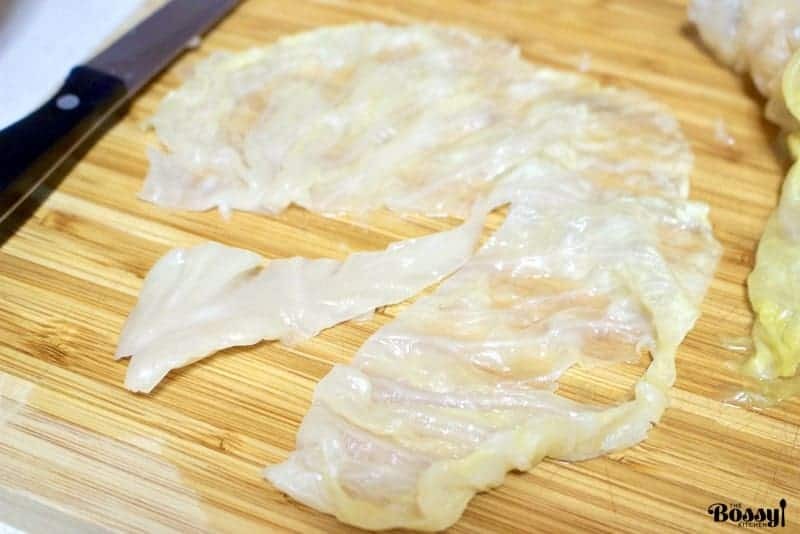 You will need to close the edges of the leaf so the meat doesn’t come out when it cooks. slice some cabbage and spread it on the bottom of the pot. The cabbage will create a cushion and keep the rolls from sticking to the bottom. Optional you can add some bacon in between the rolls for flavor, but this is only your choice. I love the smoked flavored of bacon in between. 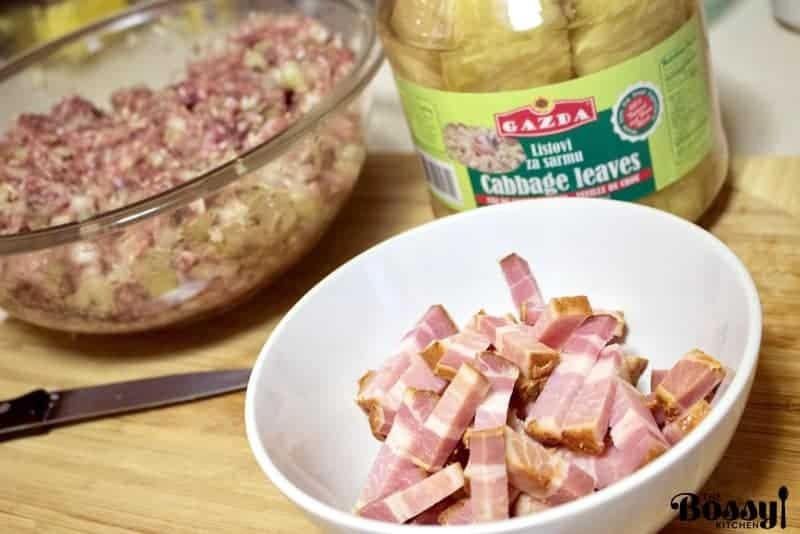 Then start adding the cabbage rolls one by one. Continue rolling until you finish the meat and the cabbage leaves. 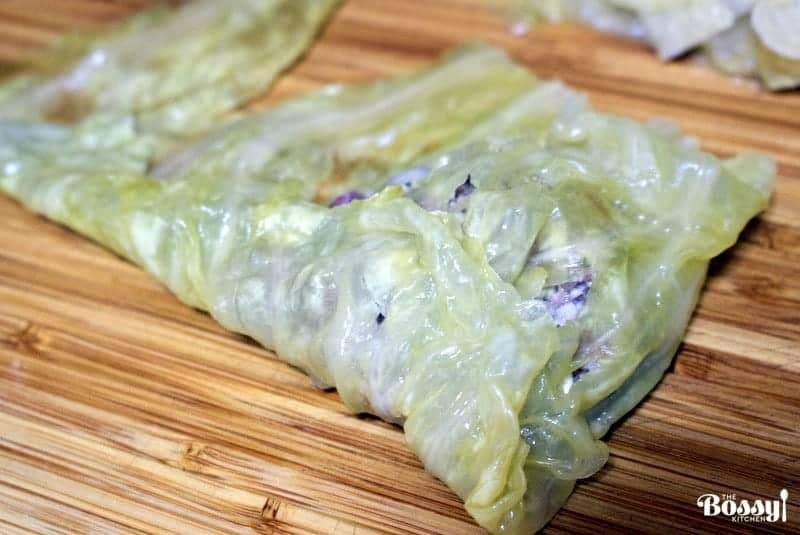 If you have leftover cabbage leaves, just slice them in thin pieces and cover the stuffed cabbage rolls with them. At this point, add more pieces of uncooked bacon(optional) and bay leaves. Also add tomato paste, or tomato juice. And water to cover them. I added some more thyme and made sure they have enough water to simmer in the pot for about 2 hours. The meat and rice need to cook through. I covered the pot with the lid and put it in the oven at 350F for about 2 hours. I removed the lid and let the stuffed cabbage rolls bake to get a golden crust, for another 2 hours. If you notice the water evaporated and there is no liquid left, add a little bit more water but make sure to not fill up the pot again. Serve the stuffed cabbage rolls warm with polenta or bread, a dollop of sour cream on top and optional hot peppers. They get better after a day or two, if you have leftovers. Enjoy! 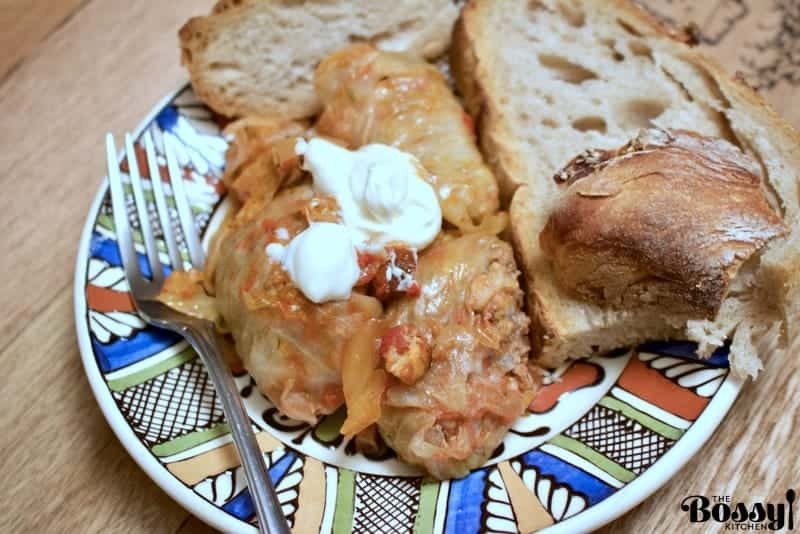 Authentic Romanian Sauerkraut Stuffed Cabbage Rolls- a great recipe for feeding a crowd, take it to potlucks and family reunions. 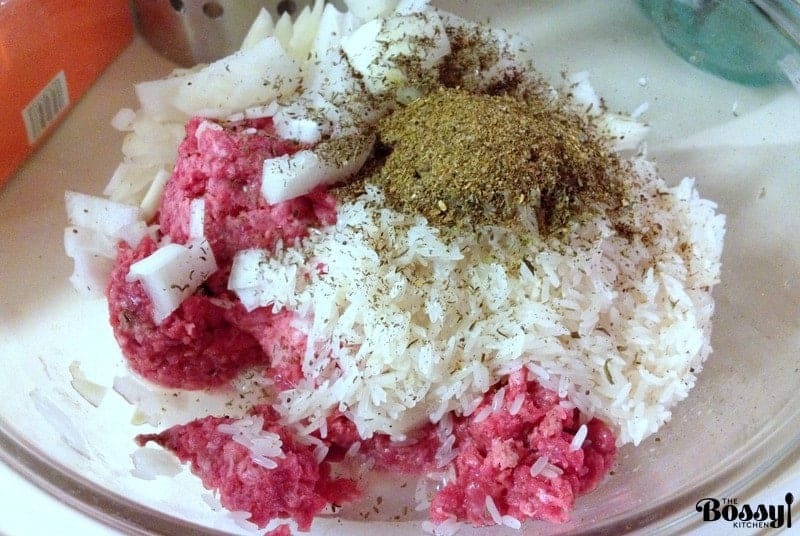 In a large bowl place together ground meat, diced onions, rice, thyme, ground pepper and marjoram. Mix everything really well. Prepare the cabbage leaves by removing the core and the thickest part of each leaf. If the leaves are too big cut them in half. 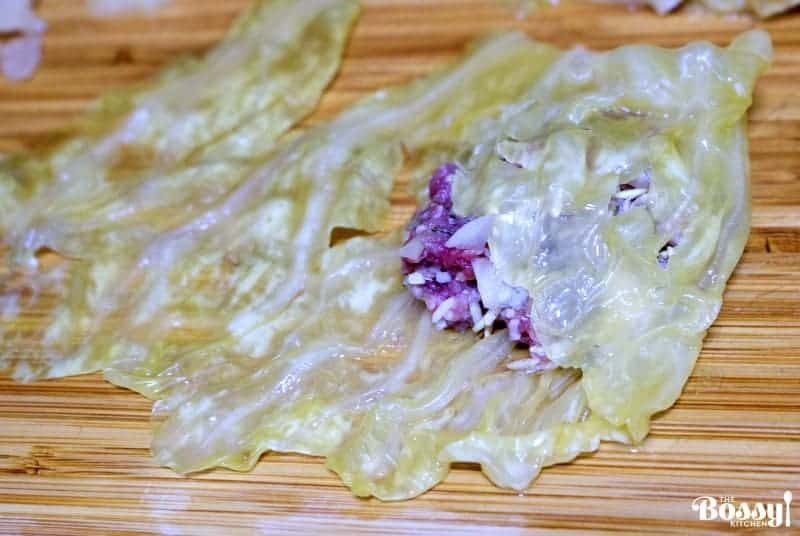 Grab a cabbage leaf and place 1 tablespoon of meat on it. 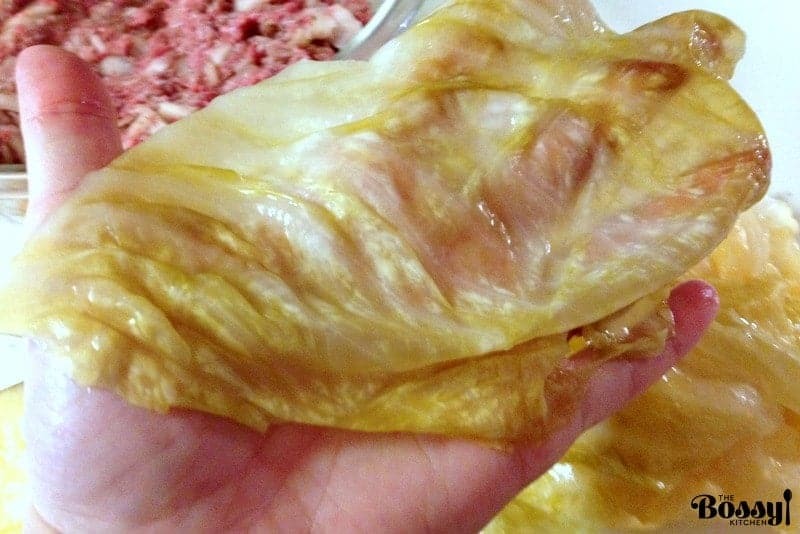 Wrap the meat inside the cabbage leaf to obtain a neat roll. Place shredded cabbage on the bottom of the pot, then start adding the rolls. Optional, you can add a layer of bacon over each layer of rolls. 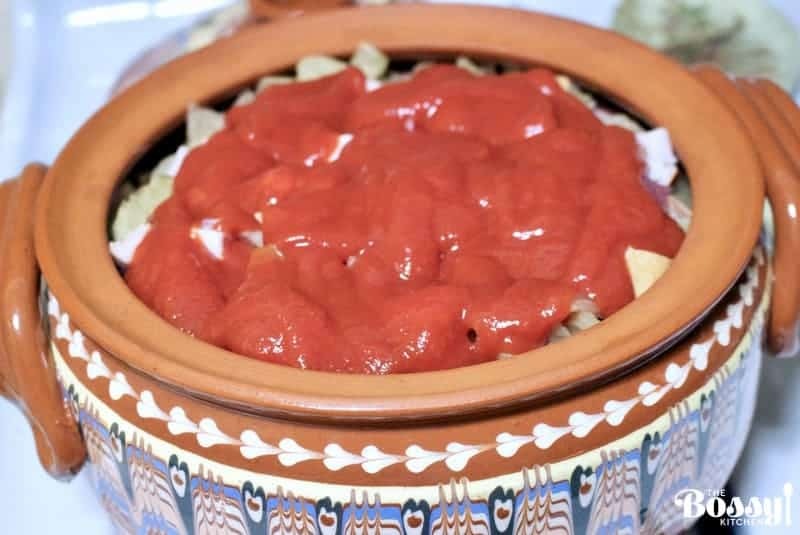 Fill up the pot with cabbage rolls, then mix together the tomato juice and the paste and pour it over the rolls. Add water to cover them. Sprinkle more bacon, thyme and bay leaves and cover with a lid. Introduce the pot in the oven at 350F for 2 hours. After 2 hours remove the lid and let the cabbage rolls bake for another 30 minutes. 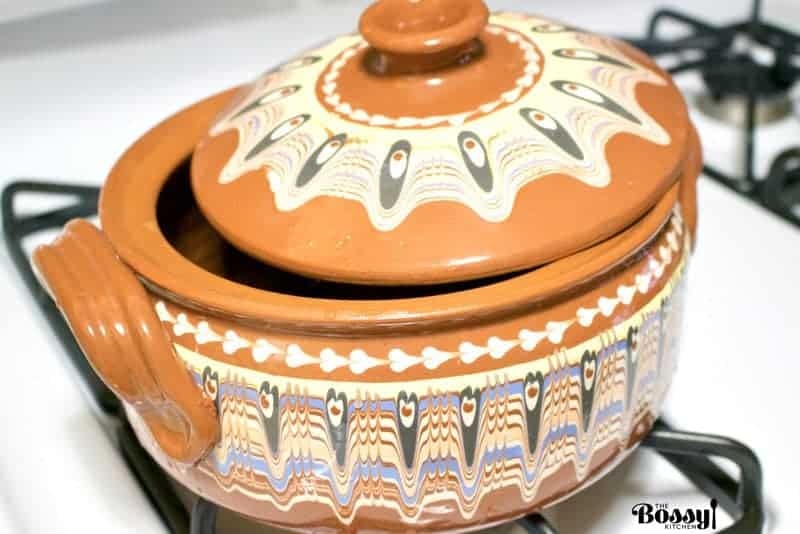 You might notice the water evaporated, so you can add a little bit more, but do not fill up the pot again. Serve them warm with a dollop of sour cream on top, fresh bread or polenta and hot peppers. 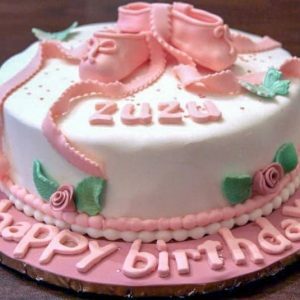 Thank you so much for sharing your family recipes. 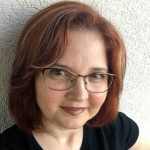 My fiance’ is from the Transylvanian region of Romania and I am excited about trying this recipe. So glad to hear that. Let me know if you have any questions. 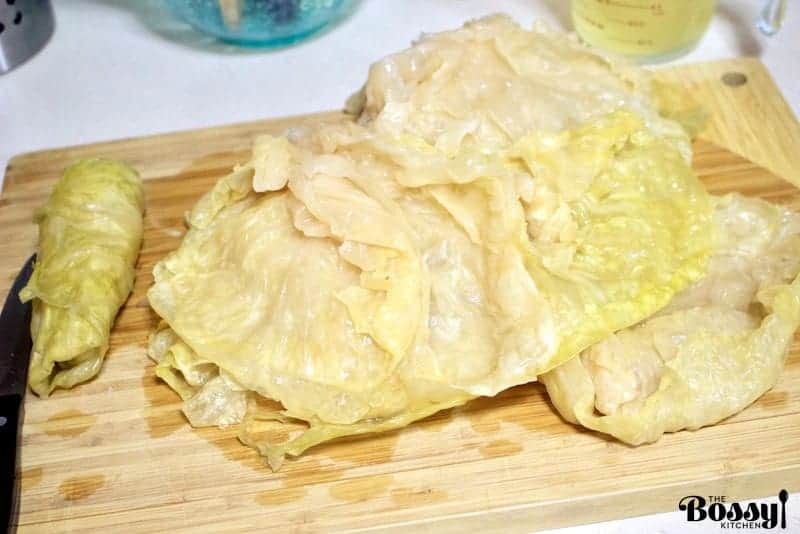 Hi Ron, This recipe is made with sauerkraut cabbage, so the leaves are already pliable and soft. If you use fresh cabbage, place a big pot with salty water on the stove and bring it to a boil. Meanwhile, separate the cabbage leaves from the core, trying to not damage them. Place the leaves in the boiling water for 2 minutes, remove and drain them. Now they are pliable and easy to use. Make sure you remove the core from each leaf, like I explained in the post. Hope this helps! Thank you for visiting. 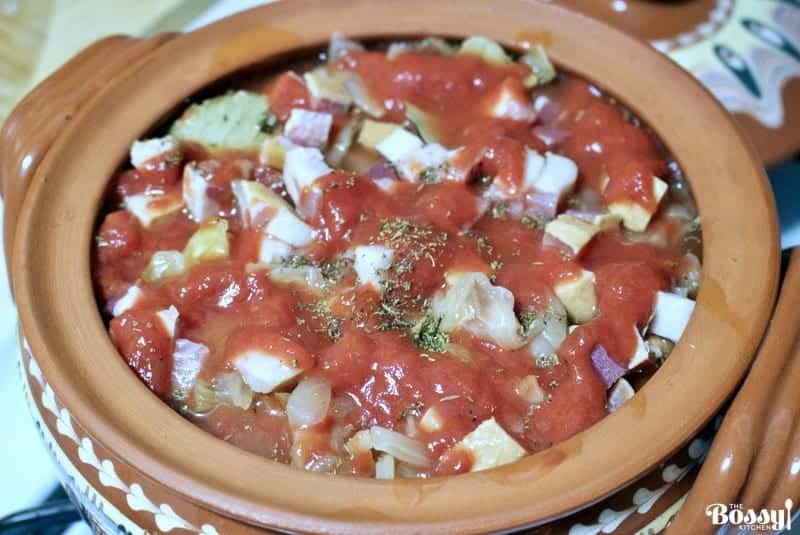 Our local newspaper ran a review of a new Romanian restaurant in town and the owner commented that his authentic sarmales took two days to prepare. First the cabbage leaves are blanched with vinegar then they are frozen before being stuffed. 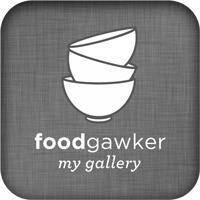 The recipe wasn’t included in the interview so thought I’d search for one. None of the recipes I’ve searched have included this step. Is this something particular to the chef’s native region of Romania? Hi Jon, Sarmale are made all year round in Romania. 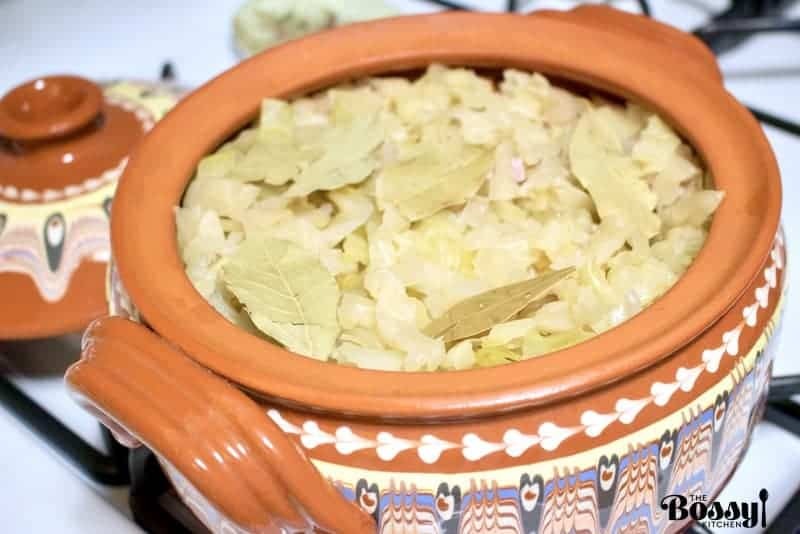 In the summer, we use regular cabbage that is blanched in salted water, sometimes also with vinegar to make it more pliable and easier to work with. The cabbage leaves can also be frozen for later use, which I think the chef you are talking about might do that. He probably prepares the leaves in bulk and freezes them for later use. 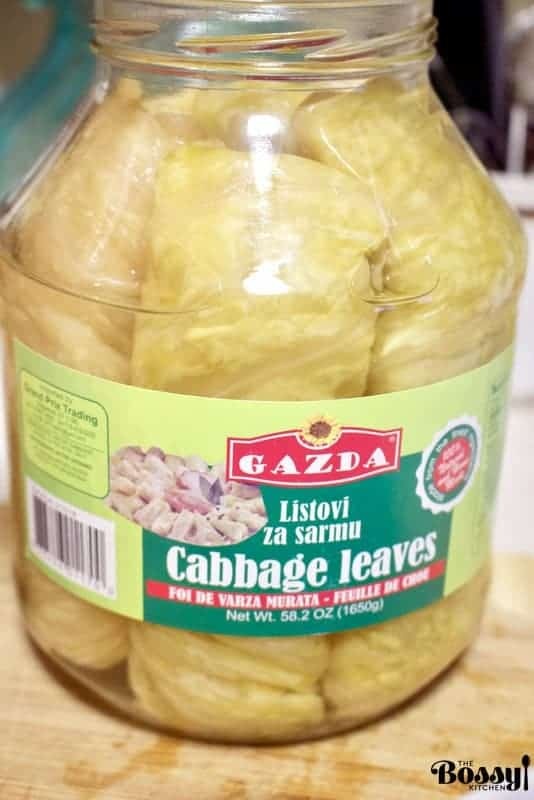 Otherwise, the most popular way of making the stuffed cabbage leaves is using the pickled/sauerkraut cabbage leaves that I used in my recipe. 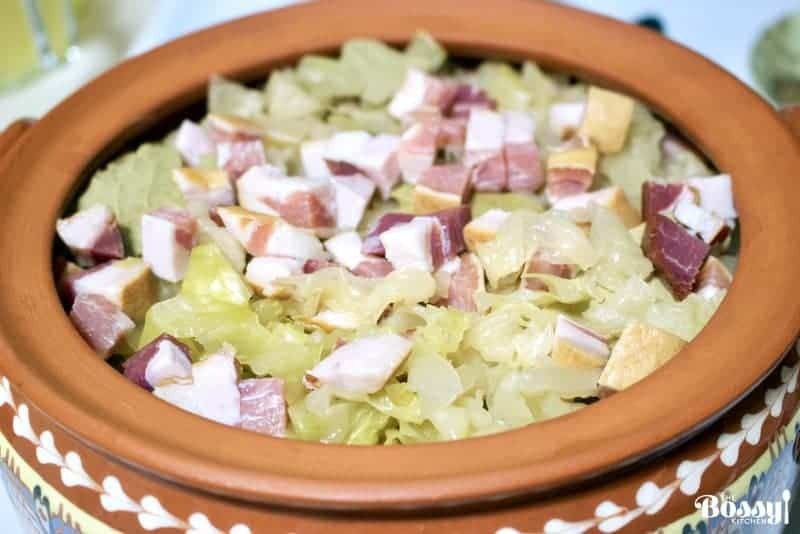 I grew up with sarmale mostly in the winter, therefore the cabbage was pickled in water and salt, in a big barrel, but in other regions of Romania, people make sarmale whenever they have cabbage available. This is when they have to blanche them in water and vinegar. If you choose to do it this way, you do not need to freeze the leaves, you can use them right away. I hope this answers your question.